I was so interested in writing up the last article of Jstar’s Chronicles that I may turn “Critically Best/Worst” into its own thing someday. For now however, I’ll finish off this two-parter of “Critically” for games on Nintendo Switch. I use my personal findings and reviews on Metacritic to decide what’s the worst game available to get on the Nintendo Switch, in a readable form that also includes straight-up descriptions and less interference by design. Let’s begin! Vroom in the night sky is a magical bike action game. There are various night skies in this world, and it is the work of Magical Girls to collect Stardusts there. 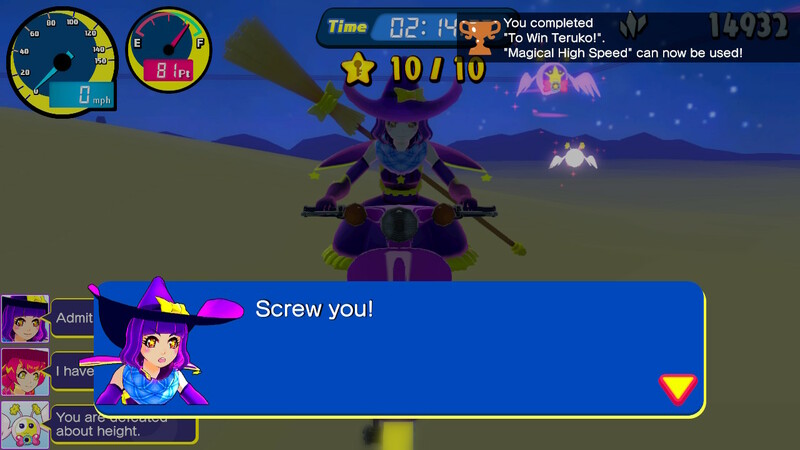 You become the Magical Girl Luna, ride a magical bike, fly around the night sky and collect Stardusts! The Magical Gate is floating in the night sky. In order to open the gate, you need to collect the necessary number of Keystars floating in the night sky. By collecting Keystars faster and entering the gate, you can get more Stardusts. Besides, by manipulating the motorcycle more technically, the number of Stardusts will be increased. By using the collected Stardusts, you will be able to get a new magical bike. If you get a powerful magical bike, you will be able to more easily collect Stardusts! This one should be pretty self-explanatory. It doesn’t look good, gameplay isn’t great, and as a launch title it simply didn’t stack up to it’s competition at all. Zelda outright demolished everything, but this is simply the worst. Terrible grammar, slightly confusing controls, it was overall a mess, to be fair. It won lowest user and critic score, so… well, there it is. Vaccine is a new approach on Survival Horrors inspired by those of the 90s. You can choose between the two members of a special bio-hazard rapid response team, each starting with their own unique differential abilities. They are trapped in a strange house populated by dangerous mutated creatures, they will have to find a vaccine for another team member who is infected with a deadly virus. The second worst game has a better score compared, and even an average user score. Some people suggest it brings with it a nostalgic feeling of old Resident Evil and Silent Hill games, while others, including a review from “Vooks” suggest that “I don’t like using this word much, but Vaccine seems like a cynical cash grab.” Another review, “Cubed3”, says that “With much more variety in level design and more enemies, Vaccine could have been an interesting guilty pleasure. In its current state, this seems more like pre-alpha build with many of the features not yet implemented.” With how the game looks and plays, it makes sense to agree in this case. Very understandable in this case. 1-2-Switch, to many (including me), felt like a game that should have been released either as a pack-in for the Switch, or much cheaper. It has a slight reek of shovelware, and while it didn’t exactly look “rushed”, it feels like it doesn’t have enough content to justify its existence as a $50 game. For game #2, some of the reviews suggested that it feels like a mobile game that shouldn’t cost $10, yet it does. It’s the 3rd lowest rated Switch game on Metacritic for Critics, so it wasn’t exactly a heavy hitter for them either. If you guys want more of these sections in my upcoming articles, please don’t hesitate to let me know! #hungrylittleman left us some news. Duck Game coming to @PlayStation on August 22. Overwatch: Reporting on console will be available when patch 1.14 goes live (the patch that has DM and TDM and is now on the PTR for testing). Let me know what you want to see from these articles for next week! Until then, thanks for reading!